Cloudera S3 Connector in Cloudera Manager securely connects your CDH cluster to Amazon S3. C5.11 adds S3 Guard for list consistency and support for IAM roles in Cloudera Manager. C5.10 connects Hue, Impala, and Navigator securely with the Cloudera S3 Connector Service. C5.9 adds support for Amazon S3 with plain-text credentials using Cloudera Manager safety valves. For a secure and fine-grained connection to Amazon S3 (for Hue, Impala, and Navigator), Cloudera recommends its S3 Connector service in Secure Mode with encrypted access keys and Kerberos and Sentry installed. Important: Hive is not yet supported in Secure Mode. To connect Hive to S3, use "Unsecure" Mode. Select Administration > External Accounts. Click Add Access Key Credentials or Add IAM Role-based Authentication. Important: IAM Role-based Authentication is not fine-grained authentication. Also, to use it with Hue, configure the region in hue_safety_valve.ini–see step step 11. To connect your AWS root user, add the Access Key ID and Secret Access Key for your root account. To connect an IAM user, add the Access Key ID and Secret Access Key for a read-only IAM account. If you have an Amazon DynamoDB database, check Enable S3Guard for consistent read operations. Warning: Components writing data to S3 are constrained by the inherent Amazon S3 limitation known as "eventual consistency." This can lead to data loss when a Spark or Hive job writes output directly to S3. Cloudera recommends that you use S3 Guard or write to HDFS and distcp to S3. Click Enable for <cluster name> to give Hue access to S3 and S3-backed tables. Impala must have permissions defined in Sentry. If using access keys, select Secure or Unsecure mode. Select Unsecure to use Hive. Click Continue (at Step 1) if your cluster passes validation. You are automatically taken to step 5. Click Continue (at Step 5) to restart Hive, Impala, Oozie, and Hue. When finished, click Home to see the S3 Connector. Note: A gray status icon means the S3 Connector service was successfully added. If using IAM roles, set the region to us-east-1 (N. Virginia) in hue_safety_valve.ini. If not, ignore this step. Note: Configuring hue_safety_valve.ini is a temporary Hue workaround for CDH 5.10. Note: The S3 Connector service is not added when you use IAM roles. Related topics: How to Configure AWS Credentials and Configuring the Amazon S3 Connector. This section assumes an AWS account with access keys, but not necessarily a Kerberized cluster. Hive Service Advanced Configuration Snippet (Safety Valve) for core-site.xml. 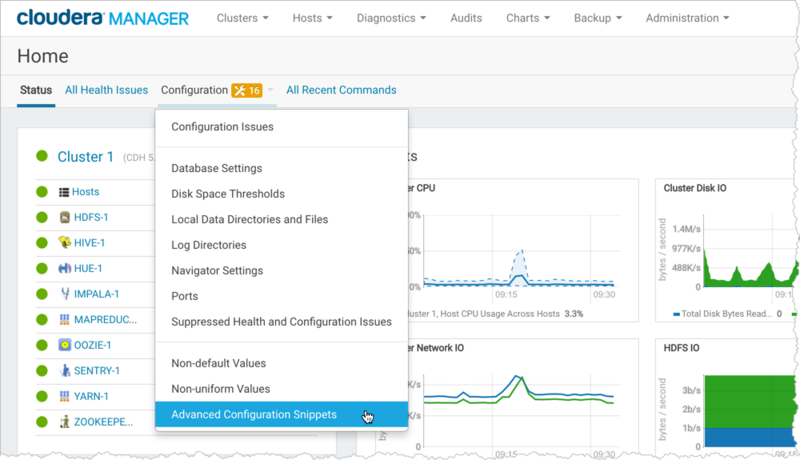 Log on to Cloudera Manager and select Clusters > your cluster. Note: Store your credentials in a script that outputs to stdout. A security_token is optional. Clear the scope filters and search on "core-site.xml". Related topics: Amazon Web Services (AWS) Security. To integrate Hue with S3, you must have an Amazon Web Services (AWS) account, with access keys for either your root user or a read-only IAM user. Create an AWS account and sign in to the AWS Console. Expand the drop-down menu under your account name and select My Security Credentials. Click Continue to Security Credentials. Expand Access Keys (Access Key ID and Secret Access Key). Click Create New Access Key. Click Show Access Key or Download Key File. These are your AWS root credentials. Important: AWS requires that your first IAM group and associated user has administrator access. Click Groups and Create New Group. Enter a name and click Next Step. Filter on "admin" and select the AdministratorAccess policy. Click Next Step and Create Group. Create a second group with AmazonS3ReadOnlyAccess. Create two IAM users and assign one to the admin policy and one to the S3 read policy. Click Users and Add User. Enter a name, and at a minimum, select Programmatic access. Select the group with administrator permissions. Click Next: Review and Create User. Create a second user and assign the group with S3 read-only access. Click the name of your read-only IAM user. Click the Security Credentials tab. Click Show Access Key or Download Key File. These are your IAM user credentials. In AWS, IAM files are used to create policies that control access to resources in a VPC. You can give IAM roles and permissions to your Hue servers to allow the Hue S3 browser to make API requests without the need to use or distribute AWS credentials (accessKey and secretAccessKey). For more information about IAM, see the AWS Identity and Access Management User Guide in the AWS documentation. For instructions on how to create an IAM role, see Creating a Role to Delegate Permissions to an AWS Service in the AWS documentation. For information about granting permission to Amazon S3 resources, see Managing Access Permissions to Your Amazon S3 Resources in the AWS documentation. Only the Hue servers need to have an IAM role applied to them to access S3 with the browser. The Hue S3 browser does not become available until the Amazon S3 connector service is added to the cluster. ListBucket on the Amazon S3 resource is necessary to drill down into that bucket, along with ListAllMyBuckets on all resources. These permissions do not give access to other private buckets in that AWS account, although public buckets are accessible. The following example IAM policy shows the format to use for the Hue server permissions. Your Amazon Resource Name (ARN) will be different. For more information on ARNs, see Amazon Resource Names (ARNs) and AWS Service Namespaces in the AWS documentation.